Verdict: 4.25 / 5The Flash series continues to impress. #50 is a must-read! 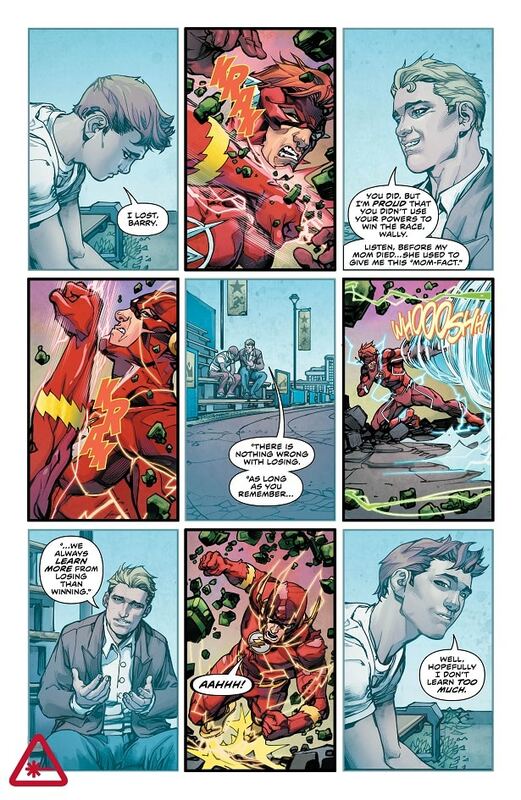 The Flash #50 marks the end of some long-running tension between Barry and Wally. This high stakes affair all comes down to speed and heart. The focus of family is strong in this issue and the personal consequences are deep. The cameos are many, the surprises big and the ultimate compliment for this is that it truly feels like a Flash story. With the last issue, I voiced my doubts as to the new forces that were introduced. I was hesitant that the 50th issue would be yet another fight for one of these forces, explaining more lore that has been retconned into the DC universe. I am happy to announce that I was wrong. The Flash #50 featured these strange new forces and almost promised that there was more to come, but sidelined these in favour of personal conflict. The race between the three Flash heroes very quickly entered the hypertime, a realm that gave all three of these speedsters the chance to go anywhere in time, perhaps changing whatever they wish or living in alternate timelines and therefore realities. Each of these three had lost someone close to them and the hypertime was a tantalising opportunity to reunite with these loved ones. It is brought up again and again that it is loss that makes a hero, but perhaps what we learn is that it is the love of those you lost and still have that truly makes a hero. Wally had a very dynamic arc in this issue, never straying too far from the breakneck speed that he faces life with, but also slowing just enough to recognise both his and Barry’s flaws. Wally understood that to be a hero was to hold onto those you still have, but he will never give up on the search for his children, a search complicated by the fact that no speedster can now travel through time. The fight against Zoom is more of an emotional one than physical, although its consequences are just as rough. Kid Flash has been abandoned one too many times, resorting to his friendship with Robin for some comfort. Whilst one Wally starts to understand the value of the Flash family, another has started to stray, although neither seems to be hanging around too long. 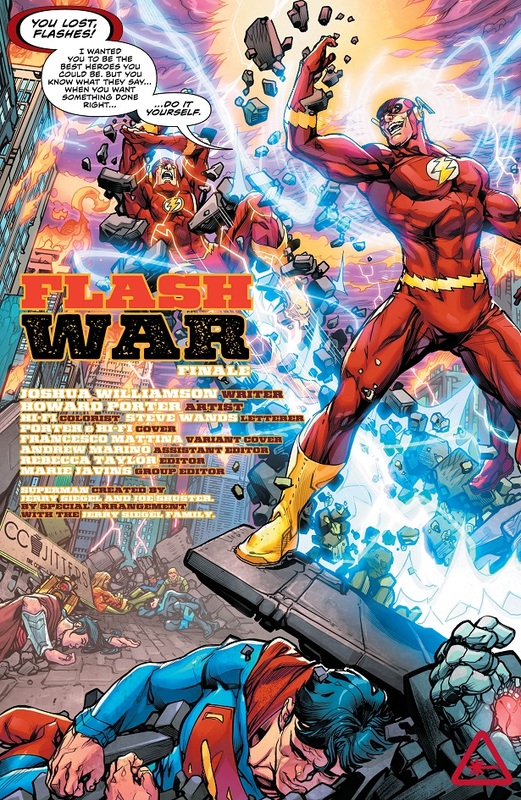 The first was the return of Bart Allen, a new and fresh face for the Flash family, adding Impulse to the team. Commander Cold has also been stranded in the past, so expect him to become a regular hero alongside this new duo of Barry and Bart. Our second reveal is from the 25th century and shows us that the Renegades have unleashed a Flash villain that is all too keen to get revenge on the whole speedster clan. Who this is remains to be seen. However, judging from the size there are only a few options available. For me, my first thought was that of the CW’s version of Savitar, perhaps adapted to the pages in a twisting fashion. The Flash #50 is a fitting tribute to both the past and future of the series, capitalising on what moves the title forward; the continued focus on a Flash family. Divided or together, they are some of the most compelling characters in the DC universe.